As we near our 200th educational app review, we are pleased to share with our readers the latest and greatest things that development group, Tribal Nova has to offer your preschooler to kindergartener. Tribal Nova is no stranger to the app world, with several iLearn With educational series already on the market: Seasons, Counting & Addition, and Mighty Jungle Animals. In each, users play and learn alongside kid friendly characters, Poko, Bibi, Babu and Mr. Murphy. As of late, this friend list is growing as your child visits the Planet Boing. Planet Boing HD is like the “hub station” that connects all the educational series in one central location as it tracks and reports your child’s progress. As your child builds essential skills in math, science, language and literacy to name a few, they will be encouraged and rewarded through a variety of game break type activities. As our own resident expert explored, all we could hear were “hoops, hollers and oh ya’s”. Planet Boing HD is a free download to your iPad device and runs on those devices with an iOS of 4.0 or later. Upon entering Planet Boing HD, parents or educators will want to establish an account, a total of four can be created. Each account is associated with an avatar or icon and that child’s birthday. Depending on the number of devices in a school or home environment, the ability to switch accounts is very easy. Planet Boing HD was designed to meet the academic needs of children ages 3-6, but it also meets the “gaming for a reason” requirements of both parents and educators. From the main menu of Planet Boing HD, children are able to see not only their avatar but a colored tracking bar. This indicates their success based on those academic skills experienced. In addition, a new reporting feature is now associated with most iLearn With educational app series. An adorable eye winking bumble bee indicates that a particular series is connected to Planet Boing HD. Parents and educators can now see how their child(ren) are virtually growing while they play with Poko, Bibi, Mr. Murphy and their friends from Ice Land Adventures, a new literacy application now available. See what is “buzzing” around as your child games for a reason. The iLearn With “academic trees” are currently broken into four categories: Math, Literacy, Science and Language. Branches of each of these trees indicates which games will reinforce specific skills. By simply selecting a section of a branch, additional information is provided of those skills played/not played and the user’s level of success. If an educator or parent feels that a particular skill needs reinforcing, users can immediately access it by clicking the play button. Whether your child is developing their understanding of phonics, letters, days of the week, weather, numbers or operations, a little “down time” is always a nice reward. Such down time would be to design your very own alien within Planet Boing HD. Aliens can be customized in a variety of ways through a roller deck of options. Such options include: altering their aliens hands, feet, eyes, nose, and accessories. Initially this roller deck is pre-installed with items, but to increase those options, users must play within the iLearn With educational app series. At an early age, they will be learning that you can’t get something for nothing! By simply tapping a needed item, users are then connected to a particular iLearn With app series. Through leveled progress activities in science, math and literacy, users will earn or unlock new customizations. Once items are earned, users can then go on a psychedelic like ride as they zip along the planet’s floor to unknown places in the sky. iLearn With Poko: Seasons is an application which develops ones vocabulary as your child learns the essentials to the seasons and weather. Here are the skills that will be uncovered. ✔ Game 1: Weather conditions – Learn to distinguish seasons and weather conditions by comparing different pictures. ✔ Game 2: What to wear – Find Poko and Bibi’s clothes and objects that do not fit weather conditions. ✔ Game 3: Days and activities – Explore week days and match the right activities to the weather conditions. iLearn With Poko: Addition is an application which encompasses both numbers and early addition facts. Here are the skills that will be uncovered. ✔ Game 1: Bowling – Count and add up to 6 bowling pins by playing with Poko and Minus. ✔ Game 2: Building blocks – Help Poko, Bibi and Minus group sets of blocks and learn to add up to 10. ✔ Game 3: Poko’s toys – Find all the objects Poko is looking for in his room and learn to add up to 15.
iLearn With Ice Land Adventures is the newest addition to the iLearn With series and builds your child’s knowledge of letters, phonics and words. ✔ Game 1: Letters – Learn upper-case and lower-case letters as well as their names. ✔ Game 2: Phonics – Compose syllables by combining vowels and consonants. ✔ Game 3: Words – Spell words by placing letters in the correct order. As you can see Tribal Nova has been hard at work to make their educational apps meet the needs of our school age children. Through vibrant graphics, familiar characters as seen on TV, clear and concise directions, a great deal of repetition and reinforcements, your child will be saying “iLearned With” and had fun while do so. Overall, we love the recent updates and additions that Tribal Nova has offered to our iPad device. In the coming weeks, see additional branches of learning that will be offered on Planet Boing HD. The three iLearn With series briefly mentioned above can be downloaded to your iTunes library for $2.99, however, keep your eyes open for future sale prices. To learn more about Tribal Nova, please visit their website here. If you are interested in making a full educational connection and management system for your child’s learning, then be sure to add Planet Boing HD to your device today by simply clicking here. A disclaimer that should be shared with my readers is that Applicable2U was a part of the pedagogical design of iLearn With – Ice Land Adventures HD and Planet Boing HD. Years ago an educator shared with those participating in a professional development course that our brains are filled with file folders. Inside such folders are memories, experiences and informational facts. As adults and children, we pull or sort through these file folders on a daily basis. This visualization has stuck with me over the years as I fill my own 6 year olds filing system. Upon entering kindergarten this year, my son’s teacher indicated that he would be expected to know 25 sight words by June. Sight word acquisition is a critical building block as preschoolers to first graders learn to read. Amazingly, children that are familiar with Dolch’s word lists will have access to 75% of what is printed in most pieces of children literature. As a parent or teacher, what strategies do you implement to support your child on the road to reading? A large number of homes and schools are equipped to introduce and reinforce sight words but are their efforts fun? With the popularity of implementing mobile devices in various environments, there are a number educational apps in the App Store which support this concept. However, how many actually create informative reports for both parents and educators? Developer, Marcel Widarto looks to teach 200+ sight words through games, Sight Words Hangman being his first, but as of late he has added to this collection. At the end of April, he launched Sight Words and Spelling with Pixopop. Come play and learn with Ugly Doll or Hello Kitty like characters: Draco, Stitch, and Pinku in three modes of interaction on your iPad device running iOS 4.3 or later. With a simple design, colorful graphics, game play repetition, verbal/visual reinforcements, and academic support, Pixopop might be the yellow brick road to learning that you were looking for. 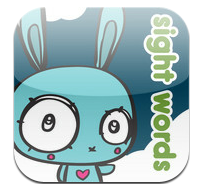 Experience Sight Words and Spelling with Pixopop with the support of an adult or independently. By spending one to one time with your child or students as they learn and practice their sight words, you will be providing them a greater chance to integrating them into their long-term memory. 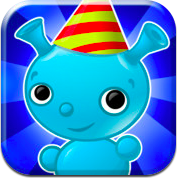 Upon entering this educational app, users will be immediately introduced to Stitch Bunny. In addition, the target audience (preschool to 1st grade) and those instructing will find Sight Words and Spelling with Pixopop to be very kid friendly. Developmentally children learn new information in stages. To support this idea, developers have included three levels of play; Flash Card, Word Challenge and Spelling. Each mode of play offers 24 word lists with 10 words in each. Exploration can begin by simply tapping a game mode and a friend to learn and play with. Concerned that with your download that you won’t have access to all word lists? Don’t be!! For $1.99, all 240 words are at your disposal. A note to the developers – might it be possible in a future update to include the option to add multiple accounts? By adding this option, homes with multiple children or schools with only a limited number of devices will benefit from this educational experience. We have explored and reviewed several educational apps which looks to reinforce those sight words commonly seen in the English language. Each has its own positives, however as we tested out Sight Words and Spelling with Pixopop, developers have included some added components. The first being a simple, but very effective reporting system. As a parent and an educator, this is critical. Reports are generated for every exposure; words that are completed, incomplete and failed. Upon entering the bar graph icon from the main menu, parents will get a quick view of results for each word list which is dated and timed. If interested in seeing more, simply click an individual list to see a more detailed report indicating those words that your child struggled with. Words that have been reported as incomplete or unsuccessful while playing in the Word Challenge or Spelling mode will be added to the users “tricky words” list. These tricky words can be selected in either of the modes of play and re-experienced in order to gain mastery. A note to the developers – might it be possible to allow users to share reports via email with other interested parties, like a parent or an educator. Let the positives continue. The objective of this application is to learn, reinforce and master the Dolch’s word lists necessary for early elementary students. However, we believe it can even go one step further. From the main menu click on the “cogwheel icon”, here parents will be able to change the level of difficulty while playing the Word Challenge game based on their child’s needs. In addition, parents will be able to view default word lists 1-24 and to create new word lists of their own. With a very clear and concise design, developers have included the ability to create individualized word lists. Since those pre-installed lists have 10 words per level, we assume that the same number of words are added to those designed by you. Along with written words, users can record themselves saying each word. As suggested by the application, those building new word lists should read the word, along with reading it, it would also be helpful to put it in a sentence for meaning which will guide users during the spelling mode. The integration of this feature is so wonderful because what student doesn’t come home with a weekly spelling list? If your home is like mine, each night your child is expected to complete an activity which reinforces their spelling list. Why not make your mobile device an activity? If looking at this application for older students, it is most certainly applicable to you. With no in app purchases or the ability to click buttons linked to outside sources, Sight Words and Spelling with Pixopop is now on our academic agenda. It’s time to prepare your child for a future of reading and spelling. Your child will have the ability to build their academic mantle piece with success trophies along the way. This is an educational app which games for a reason and is considered a top pick from our opinion. If you would like to learn more about Marcel Widarto, please visit his website here. Whether you are a preschooler to elementary school student, Sight Words and Spelling with Pixopop is worth adding to your iPad device today by simply clicking here. This review is also featured on Fun Educational Apps site along with several other detailed educational app reviews. Come play with letters in order to build and spell words that look like animals or imaginary creations. Use your fine motor skills to rotate, enlarge, move and flip objects to manipulate your ABC’s as you explore in three modes: plAy, Beasts, and Create. Launched in early February, developers from Happi created Happipets, an usual approach to spelling words for your iPad device running iOS 4.3 or later. It is designed with a younger generation in mind, however, even the oldest of children and adults will enjoy exploring. What pets will your child create? With 12 real animals, 12 imaginary ones and over 140 letters to build just about anything, your child will feel like they are watching an episode of Word World on PBS Kids. Drag, drop and recognize animal names or individual letters to your workable canvas as letters turn into a picture or scene. As you initially explore Happipets, Applicable2U would suggest that you collaboratively work with your child(ren). As developers state in their iTunes description, this educational app is not the usual spelling app. Regardless, with a kid friendly appearance and support systems in place, children and parents will have fun building a happipet. Get the hang of Happipets by starting in the “plAy” mode. At the top of your canvas will be a scrolling feature which alphabetically lists your 12 real world animals. Come play and learn about such animals as a dog, flamingo, lion or rabbit. Amazingly letters are artistically designed in their color and detail. With a single tap of the animals name your scroll bar will disappear and exploration can begin. The objective is to manipulate each letter around the page by enlarging, shrinking, moving, or rotating it to transform from a word to an actual animal picture. Whether you are an adult or a child, this concept visually may be challenging, but not to worry. At the bottom of the screen, users might find it helpful to click the “help” button. This help feature is the giveaway to your end result, however, you will find yourself using it multiple times. While building your animal, learn a few interesting facts about it by clicking the “information” button in the lower right hand corner of your screen. Need to start fresh and put your letters back to default in the scroll bar, click the trash can and it will clear your canvas. To access your scroll bar, simply click the pull down tab at the top of your screen. Users will know that a letter has been manipulated and dropped into its correct place when they hear a locking sound. After the animal has been correctly draw, an appropriate background or environment will suddenly appear. A note to the developers – might it be possible to offer in the scroll feature a single and double tap. The single tap could say that animals name and the double tap option could drop it on the users canvas. Without adult supervision as it is set now, users will not know what animal they are learning to spell or create. In addition, we would love to see an audio feature added in two areas. First, as a user manipulates letters, it would great to hear that letter announced for letter recognition reinforcement. In addition, we would love to see that interesting facts could be shared aloud by simply tapping a microphone icon. As you move from playing with real animals, it is now time to play with mythological ones. Ever heard of a delipolk or a dufou?? With those same features found in the plAy mode, come explore the Beast mode. As we navigated our way through this round, we immediately made a connection to a science project that was done in a 5th grade class. Students had to create an animal of their choice, but were required to explain what it was, what were its predators or prey, what adaptations were necessary for it to survive and where could it be found. With the implementation of a drawing and word processing program, this project came to life. As technology has changed over the years, this Beast mode would be a great update to our animal studies project. As the animal comes to life and is locked into place, take a screen shot on your iPad device by simply clicking at the same time the home and sleep button. This screen shot can then be found in your camera roll and inserted into any document. The last area for exploration is the Create mode. Here users will be able to select random letters as a way to create their own pets. Since this design is by users choice, the help button is no longer present. However, a saving, scene and sharing feature has been added. Choose from a laundry list of letters and designs, 24 different scenes to add your animal too and the option to share your creation via Facebook and/or email. A note to the developers – might it be possible to put a parental lock on the sharing option for the safety of those using the application. In addition, it might be interesting to add a feature to your website that would allow Happipet application users to upload and share their creations with your followers. Overall, Applicable2U enjoyed our exploration with Happipets. It is an application that fits at home and at school. It endorses creativity and the possibilities to collaborate with others in a fun way. If you would like to contact the developers, Happi, please visit their website here. We were encouraged to see that new letters and animals will be added for free in the next round of updates. To add Happipets to your iPad device, please click here to begin your $1.99 download today! Well it’s Sunday and our weekend series review of the “learning is fun” educational apps by AR Entertainment has come to an end. We chose to conclude our weekend series with My First Words: The Complete Collection for your iPad device running iOS 3.2 or later. For a $1.99, users will have access to three categories: animals, food and colors which is stocked with a large collection of words. Within each category, children ages 2-7 can be challenged to spell various words as there are three levels of difficulty. It is important to note that levels progress based on one’s learning needs as users will find their academic supports changing. Learn to spell new words or just reinforce those that you already know in upper or lower case and script. Flip through colorful animal graphics and make connections through a sound. With every splash of color, learn how the spelled word is similar to something else, like an alien or a flower. During each experience your child will learn to arrange letters from left to right as letters pronounced will make more than 50 new words. 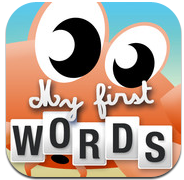 My First Words: The Complete Collection is very intuitive and easy to navigate for our young target audience. Children will have an amazing experience as they learn of new animals that they may not see or hear in their backyard, food yet to be tasted and manipulation of colored words as they play with them on paper. AR Entertainment chose to take a spelling approach not with phonics, but rather by letter recognition. As we explored, we noticed words ranging from 3-6 letters in length. The goal of this educational app is to arrange scrabble like letter pieces by dragging and dropping them into place. Interactive spelling screens provide users with an image, a fill in the blank area and lettered tiles. As each letter is tapped, it is pronounced for users. If letters are picked and dragged in the appropriate order, then users will be rewarded with an animation, stars. If users do not see a star animation, then letters were not correctly arranged from left to right. In addition we also noticed that each level provided a different type of academic support as children spelled their way through levels 1-3. Level 1 – is the introduction level as the “spelling area” indicates how to spell each given word. Users must simply match each letter into place. Level 2 – is the first of the challenge levels as the “spelling area” no longer provides hints. Users will notice repetition of words seen in level 1 and are expected to recall how to spell each word. If letters are not arranged correctly, they will fall back into the letter line up. Level 2 is users first experience with the importance of reading and spelling from left to right. 1 and 2. It is important to note that level 3 will not provide users with any hints, users can drag and drop letters as they see fit. Once all letters are arranged, those that were correctly placed will not move. Whereas those letters that were incorrectly placed will fall back down. Thus allowing the user to try again. As you exit this educational app, those words spelled are not saved to the device. Each return visit starts fresh, making My First Words: The Complete Collection a nice addition to a classroom setting or home environment. As you learn and have fun with My First Words, reinforce letters of the alphabet and see the importance of letter arrangement as a way to spell new words while developing your vocabulary. Although this educational app does not focus in on phonetic spelling, users who are familiar with that approach may want to apply it when necessary. If you have enjoyed our educational series this weekend, then you will want to visit AR Entertainment’s website by simply clicking here. If you have a toddler, preschooler or kindergartener looking to play with words, then download My First Words: The Complete Collection by clicking here to access it from your iTunes library today. Pyxwise Software Inc. has recently launched Simplex Spelling Phonics 1 and it could not have come at a more appropriate time for Applicable2U. It is now the second trimester of our school year and my son, although he is 5, is beginning to dig deeper into the mechanics of spelling and reading in his kindergarten class. We have reviewed educational apps by Pyxwise Software in the past, so we were immediately intrigued when we read in their iTunes library description, “Simplex Spelling improves English spelling and reading skills by using a powerful combination of phonics lessons, spelling/word patterns, our unique “reverse phonics” approach and contextually relevant spelling rules.” Amazingly, within days of its launch, Simplex Spelling Phonics 1 was already on the Apple’s New and Noteworthy apps under the Education category. Through our exploration, we now know why! According to research, readers who use this approach will find learners succeeding at a higher rate than those using typical flashcards. As a child embarks on the road to spelling and reading there are five key areas that a child should focus on: vocabulary, phonemic awareness, sight words, phonics and comprehension. As you explore with this educational app, teachers and parents will quickly see how these five concepts have been integrated fluidly. Simplex Spelling Phonics 1 is accessible via most Apple devices running iOS 4.0 or later. Your spelling lists can now go where you go! With a year full of spelling curriculum which has over 450 high frequency words divided into 42 lessons, your child will be building their confidence as their base foundation of literacy is being established. Simplex Spelling Phonics 1 can seamlessly be integrated into any homeschool, classroom or home environment. With the ability to create what appears to be an unlimited amount of user accounts, parents of multiple children will be thrilled that their child’s learning needs will individually be met. In addition, teachers will be pleased to see that a mobile device can now be a part of a learning center for their students. Whether using this application individually or with a teacher or parent, young readers will find a number of support systems in place along the way. Within the settings tab, users can work with either upper or lower case letters. Developmentally, this is very appropriate to focus on one or the other, however, still having experience with both. In addition, the keyboard layout can be changed to letters appearing alphabetically or like a real world keyboard. Regardless of which keyboard type you choose, letters will appear color coded, vowels will appear bluish/white in color and consonants will be red. Visually this is very effective for learners. 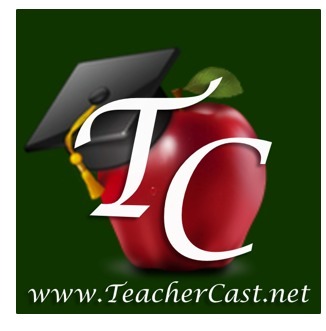 When beginning a word list, your virtual teacher will briefly explain that sound or letter combination. Proceeding this explanation, the user will be required to spell words falling under that category. Along the way, additional supports are provided such as: a hint button, the teacher saying the desired word in a sentence and various visuals clues for right and wrong answers. If a user is unsure what a colored button will do, simply click the question mark at the bottom of your window and the Simple Spelling teacher will verbally explain. With a simple tap of their finger onto any user friendly tool, letters can be: viewed with a green checkmark, dragged from left to right, provided hints and deleted if necessary. Their finger is now a virtual pencil and an eraser. So that learning is held accountable and parents and teachers can further instruct in an appropriate way, reports can be generated indicating words mastered and the number of attempts made within each word list. Strategically, word lists are organized very clearly as it starts with the basic sounds each vowel makes both short and long. Some might say that the English language is a bit tricky when it comes to those letter combination words (ie. “ai” or “ay”). As you progress from individual vowel sounds into the next lessons, users will begin to explore the complexities of these letter combinations. From there, lessons will touch on the blended sounds letter make. The overall purpose of this educational app is not to memorize, but to rather transfer this learning to become efficient readers and spellers with a solid comprehension of the phonics approach. Applicable2U is truly excited with the updates that have been made from their other spelling application, Simplex Spelling HD. Whether you have a 4-10 year old, this application is applicable to you. For a simple .99¢ download, your child or student will be gaining a lifetime of academic skills that will be applied throughout their early stages of life. To learn more about Pyxwise Software Inc., please visit their website here. It’s time that you take the anxiety that can be built up in a child when reading and spelling with a simple download of Simplex Spelling Phonics 1 to your iTunes library here.